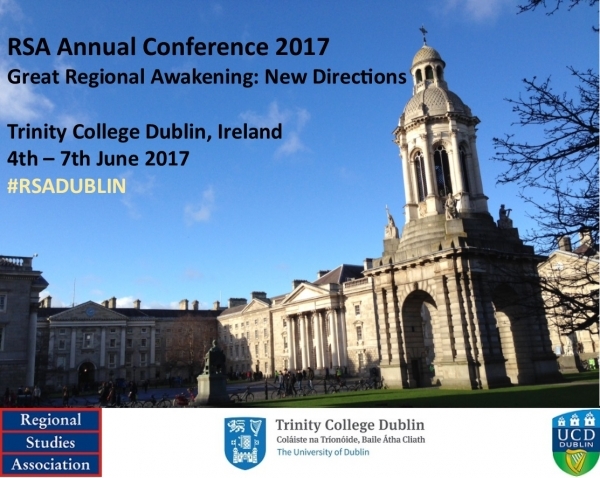 The Regional Studies Association (RSA) Annual Conference ‘The Great Awakening: New Directions’ was held at Trinity College Dublin from June 4th to 7th. The conference aims to bring together a diverse range of people interested in regional studies such as academics, researchers and practitioners. Over the four days of the conference delegates examined regional inequalities and their differing spatial impacts across the globe. The RSA is an advocate for more balanced regional development. Research is a key part of this and the RSA has identified a need to re-examine all aspects of local and regional development and how it relates to national and international economic dynamics. Representatives from a creative momentum project partner organisations, the Western Development Commission and National University of Ireland (NUI) Galway, attended this year’s conference. In a conference session on ‘Entrepreneurship, Culture and Environment’, NUI Galway presented preliminary findings its research being carried out as part of a creative momentum project. Dr. Aisling Murtagh and Dr. Patrick Collins examined how the broad ‘entrepreneurial environment’, which includes a variety of different factors such as networks, infrastructure, amenities and policy, impacts the capacity for creative entrepreneurship in peripheral regions. Preliminary conclusions indicate that a range of factors influence the potential for creative entrepreneurship. These include ‘soft’ factors such as local amenities and environment providing space for creativity and a source of inspiration, as well as ‘hard’ factors such as the presence of institutions providing education and support. Apart from providing an opportunity to communicate our research to a wide audience, the conference also provided insights that can shape our future work. In a session on ‘Developing Rural and Peripheral Regions’ we heard about the ‘institutional mapping’ method which could be useful to inform our own work on regional supports for the creative sector. We also picked up tips from an expert panel on how research can influence policy in the session on ‘Research Impact: Making your Voice Count in Policy-making’.